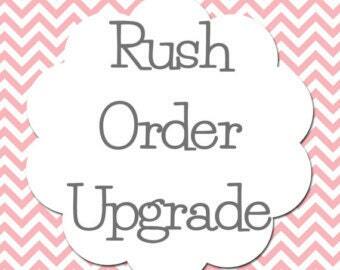 Rush Order Upgrade! Guaranteed Production within 48 HOURS! If you are running behind and need something for a wedding, gift, or just faster why not add the extra rush to ensure your package arrives in time for your big event! With adding rush to your order you can expect your items to be made within 48 hours (2 business days) regardless of how busy we are. If you choose to not continue with rush, your package will be in line and we will still continue to work just as hard to get your package out the door as quickly as possible. Ground (Domestic) delivery is still 3-5 business days depending on your location. *Disclaimer- We cannot include holidays as part of the 2 business days nor weekends.If the order is placed on a weekend. The 48 hour production time beginning the first business day that follows. My board was expedited quickly (thank you!) and we just love it!!!!!! Perfect upgrade with super fast shipping!